When it comes to our dogs' safety, is the gig economy a good model? It's a dot-com world. Wielding our smartphones like lightsabers, we order up a ride, a meal, a grocery delivery, someone to fix our leaky kitchen faucet. Many of life's mundane details can now be managed by deploying an app. So it was just a matter of time before another detail—walking the dog—popped up on the app menu. With a screen tap, pet-walking apps allow busy people to schedule their dogs' outings, promising instant updates, route information and GPS tracking. The companies market their services, which also include boarding and pet-sitting, with assurances of background screenings, insurance, and 24/7 customer support. The big selling point, of course, is convenience, and dog lovers are signing up in droves. The apps are cheap and fast; you can book a walker without having to arrange interviews, and schedule a walk in seconds with the click of a button if you get a last-minute dinner invitation or have to work late. There's a flip side to this rosy picture, however, one that should give potential users reason to consider the trade-off between their own convenience and the safety of their furry companions. 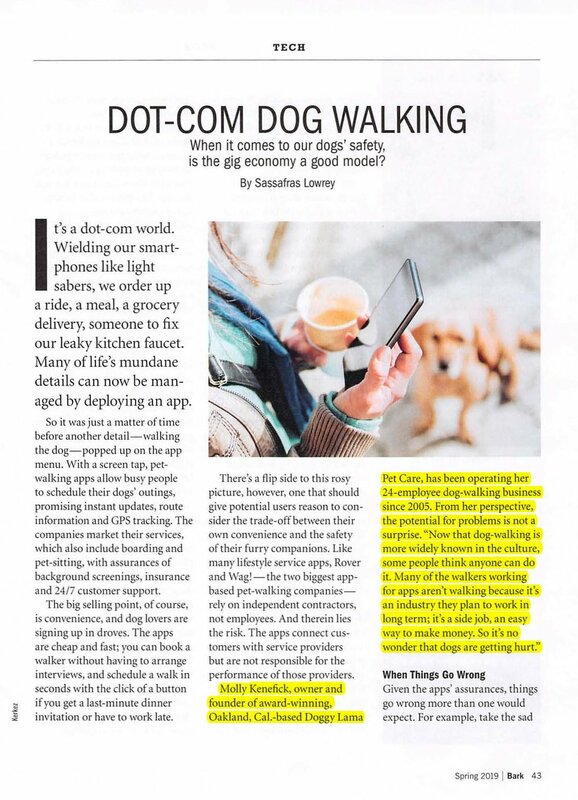 Like many lifestyle service apps, Rover and Wag!--the two biggest app-based pet-walking companies—rely on independent contractors, not employees. And therein lies the risk. The apps connect customers with service providers but are not responsible for the performance of those providers. Given the apps' assurances, things go wrong more than one would expect. For example, take the sad case of Winnie, a young Wheaten Terrier who was hit and killed by a car last year while out with a Wag! walker. Winnie was the adored pup of Sara and Nick Moore of Houston, Texas. On his Facebook page, Nick describes how they discovered their dog's fate. "When Sara did not receive the confirmation that "Winnie's walk was over ... [she] became even more concerned. Sara texted the walker, but did not receive an answer. When Sara called the walker, the walker answered and assured Sara that Winnie was home safe. 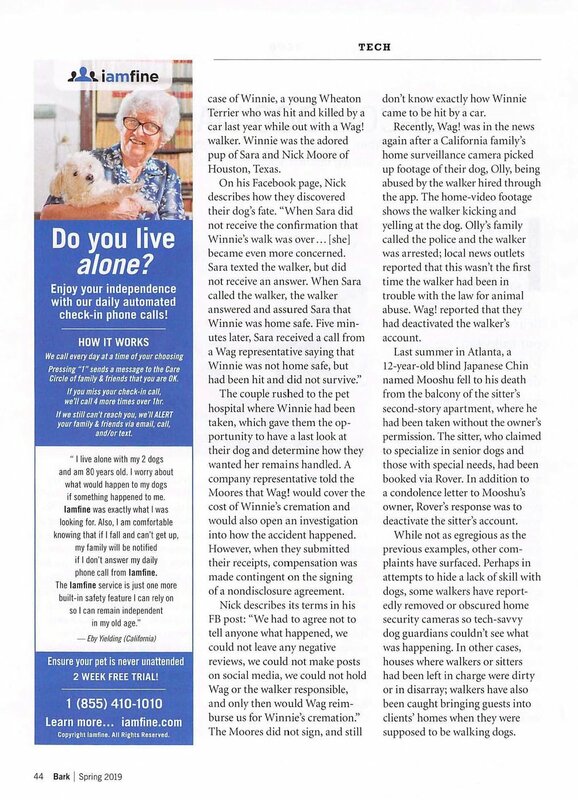 Five minutes later, Sara received a call from a Wag representative saying that Winnie was not home safe, but had been hit and did not survive." The couple rushed to the pet hospital where Winnie had been taken, which gave them the opportunity to have a last look at their dog and determine how they wanted her remains handled. A company representative told the Moores that Wag! would cover the cost of Winnie's cremation and would also open an investigation into how the accident happened. However, when they submitted their receipts, compensation was made contingent on the signing of a nondisclosure agreement. Nick describes its terms in his FB post: "We had to agree not to tell anyone what happened, we could not leave any negative reviews, we could not make posts on social media, we could not hold Wag or the walker responsible, and only then would Wag! reimburse us for Winnie's cremation.” The Moores did not sign, and still don't know exactly how Winnie came to be hit by a car. Recently, Wag! was in the news again after a California family's home surveillance camera picked up footage of their dog, Olly, being abused by the walker hired through the app. The home-video footage shows the walker kicking and yelling at the dog. Olly's family called the police and the walker was arrested; local news outlets reported that this wasn't the first time the walker had been in trouble with the law for animal abuse. Wag! reported that they had deactivated the walker's account. Last summer in Atlanta, a 12-year-old blind Japanese Chin named Mooshu fell to his death from the balcony of the sitter's second-story apartment, where he had been taken without the owner's permission. The sitter, who claimed to specialize in senior dogs and those with special needs, had been booked via Rover. In addition to a condolence letter to Mooshu's owner, Rover's response was to deactivate the sitter's account. While not as egregious as the previous examples, other complaints have surfaced. Perhaps in attempts to hide a lack of skill with dogs, some walkers have reportedly removed or obscured home security cameras so tech-savvy dog guardians couldn't see what was happening. In other cases, houses where walkers or sitters had been left in charge were dirty or in disarray; walkers have also been caught bringing guests into clients' homes when they were supposed to be walking dogs. Both companies say they are very concerned about dogs entrusted to their care, and note that walkers can be removed from the platform at any time. Jeff Davis, director of communications and corporate social responsibility for Wag!, says that the company is "constantly evaluating ways to improve information sharing with walkers to further ensure the trust and safety of the Wag! community. On our website, we provide educational content about dog behavior and health, including articles, videos and infographics. We also use our technology to deliver real-time alerts to walkers, such as weather-related warnings." This optional educational content is the only ongoing professional development that dog walkers with the company receive. Both companies said that only a small percentage of those who apply end up walking dogs, which they credit as a strength of their screening processes. Rover's public relations manager Dave Rosenbaum says that as part of their hiring process, walkers take four online safety quizzes in addition to submitting to an enhanced background check. Walkers also must go through an in-person harness check, in which a member of the Rover team shows prospective walkers how to put on and take off different types of harnesses. But that's where the training starts and ends. Rosenbaum says that Rover encourages dog guardians to set up a no-cost meet-and-greet with a potential walker before hiring to get a better feel for the match-up, but does not require them to do so. "Wag! representatives, who acknowledge that not all walkers are good matches for all dogs, say they encourage walkers to look at information on an individual dog's breed and size as well as owners' and previous walkers' notes and instructions. In the case of an injury or a dog getting lost, Rover walkers connect with the company's 24/7 safety team. Wag! also has a 24/7 response team that can be contacted via the app, and walkers and sitters are expected to notify it immediately in the event of a problem; according to the company, owners are contacted within 10 minutes of an incident. 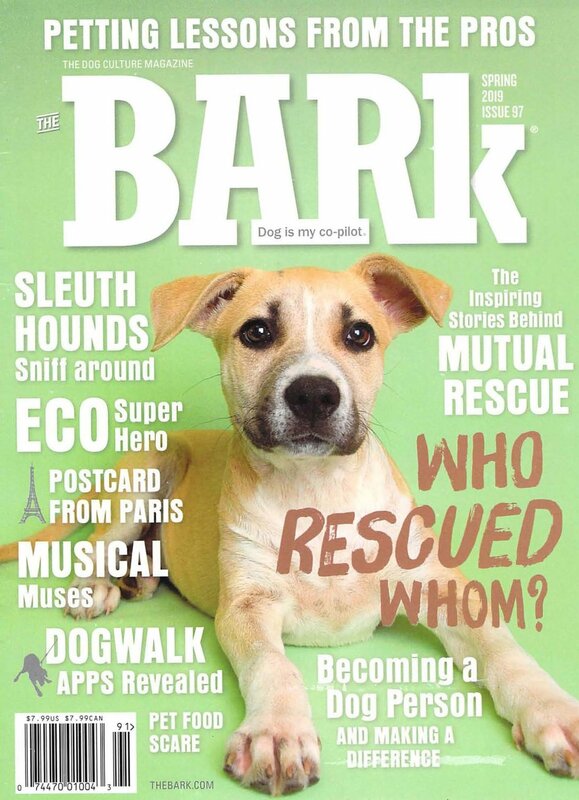 These sorts of online quizzes and dog behavior newsletters are a far cry from the kind of hands-on training that Kenefick makes sure her walkers receive. In addition to hiring walkers who have extensive history working with dogs as trainers, vet techs, or doggy daycare attendants, Kenefick makes sure that new walkers with Doggy Lama receive on- the-job training. "When walkers start with us, for at least two weeks, they walk with me and also shadow our most skilled pack walkers to see how they handle a variety of dogs and dog combinations, and navigate various trails and parks. We [invest] up to six weeks of full-time training for a new walker." By full-time, Kenefick means that the new hire goes on one or two group walks per day, which includes watching the walkers pick up and drop off the dogs, check the dogs for ticks and foxtails as needed, and fill out a paper report for each walk. Wag! and Rover both say they hire dog lovers, but loving dogs is not the same as being skilled at working with them. Dog walking is not unskilled labor, and should not be considered as such. As we don't leave human toddlers with inexperienced babysitters, it's important to be thoughtful about who we entrust our dogs to as well. News reports of lost and injured dogs make it easy to blame the corporations behind the apps and the inexperienced walkers they hire. In reality, we are ultimately responsible for our dogs' welfare. Finding and vetting qualified and experienced pet care professionals is part of that responsibility. We owe our dogs nothing less than hiring skilled, compassionate and trained professionals to care for them when we can't. Sassafras Lowrey is an author and Certified Trick Dog Instructor; her forthcoming books include Tricks in the City, Healing/Heeling and Bedtime Stories for Rescue Dogs.